EMF Diff/Merge is a tool for merging models. More precisely, it is a technical component which helps create tools that need to merge models. 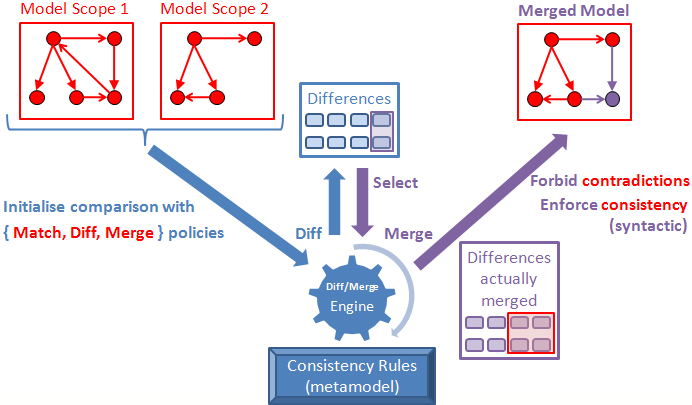 It consists in a diff/merge engine that is designed to prevent data loss and enforce model consistency during merge, thanks to consistency rules - predefined and, if needed, user-defined. It also includes GUI components. It is intended to be a booster for developing merge-based features or systems such as model refactoring, iterative model transformations, bridges between models or modeling tools, collaborative modeling environments, or versioning systems. Merging models is a common need in model-based activities, not only for version control of models but for model manipulation in general. However, it is a much more complex operation than merging source code. This is because models, in the EMF sense, are rich data structures constrained by a metamodel and sometimes subject to implicit engineering rules. Have you ever merged models in the past and obtained incorrect, unexpected or inconsistent results? This is what EMF Diff/Merge seeks to prevent. A lightweight, configurable engine for comparing and merging EMF-based models in 2-way and 3-way (with common ancestor) configurations. Matching of model elements by ID, where an ID can be any "signature" that uniquely identifies the element within its scope: Ecore ID, XML ID, qualified name, location in model tree, etc. A GUI with reusable components. Comparison can be performed on any arbitrary model scope for versatility and scalability reasons. Interdependent differences are merged together in order to preserve model consistency. The order in which differences are merged has no impact. The global impact of a merge can be determined beforehand (picture above). Undo/redo of merges is supported. The usage process is illustrated by the figure below. First, a comparison is created based on the models to compare. The differences between those models are computed according to given policies. Then, as long as differences remain, any subset of these differences can be selected for merging. Every time, predefined consistency rules and user-defined policies are used to compute the minimal superset of differences that must be merged to preserve consistency. 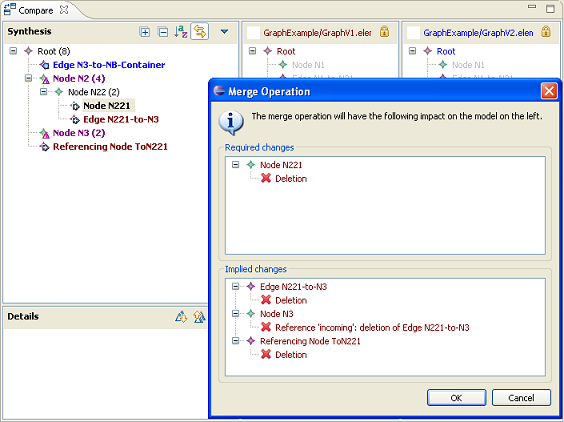 The user may decide whether to confirm or cancel the merge of the whole set of differences. For a description on how the objectives and the level of abstraction differ from EMF Compare, see the project proposal.